In August 1915, private automobiles were first allowed into Yellowstone National Park. The following year, free automobile camps with pit toilets and tap water were built at Mammoth, Lake, Old Faithful, and Canyon. By 1919, two-thirds of those entering Yellowstone by automobile came prepared to camp. 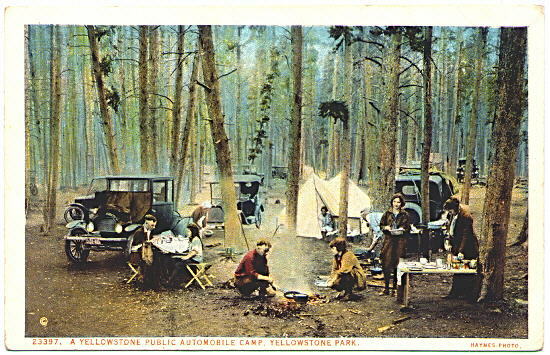 That fall, as part of Superintendent Albright's plan to make Yellowstone a "motorist's paradise," he proposed the building of many additional public auto camps. Other facilities to cater to campers, such as auto camp stores and grills, soon followed in the 1920s. Those who preferred not to stay at the larger public automobile camps were encouraged to look for designated smaller roadside camp sites.